A team of scientists are chaperoned by a war veteran to an uncharted island in the Pacific, however, things go awry and they must fight to escape the primal island. The effects are impressive and director Jordan Vogt-Roberts skilfully creates a great sense of scale. What’s refreshing is that the handful of writers don’t rehash the King Kong story of a screaming female, the giant ape falling in love and being taken to civilisation only to die. 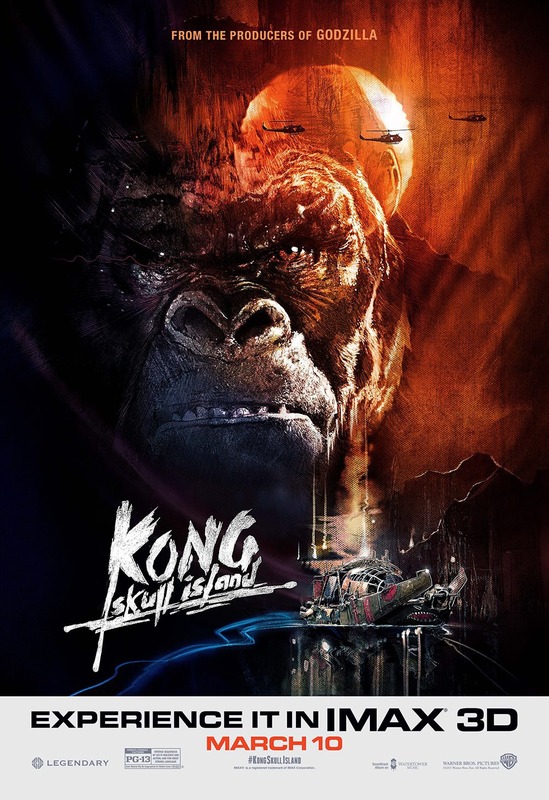 This take on the 1933 landmark film is reminiscent of Conan Doyle’s The Lost World (1960), Jurassic Park: The Lost World (1997) and the ‘monster verses’ moments of Kong films to name a few. The period Platoon-like (1986) soundtrack sells the 70’s setting along with Henry Jackman’s score complimenting the action setups. The cast are adequate including the likes of Tom Hiddleston and John C. Reilly. Samuel L. Jackson looks really infuriated throughout, and rightly so as Kong wipes out the majorly of his team. But to be honest it’s a good thing as I’d pay good money to see Jackson’s badassery (is that a word?) over CGI monsters any day. Hiddleston is surprising as tracker Conrad especially in his fight driven introduction. Brie Larson as photographer Weaver is sadly given very little to do. There’s a little confrontation dynamic between the parties when they find out that Kong is essential in keeping the equilibrium of the Island. Along with Conrad’s followers, Hank Marlow (Reilly) who has been stranded on the island since 1944, go against Jackson’s hardened vet’ Preston Packard who wants Kong dead. Notable are underused John Goodman and Toby Kebbell as solider Jack. Kebbell no stranger to motion capture (Koba, Planet of the Apes) advises Terry Notary who is excellent as Kong. Regardless of how much is actually Notary’s performance, the completed monster design is impressive especially when Kong battles giant ancient creatures. The humour is largely hit and miss due to the dark tone and post Vietnam War backdrop. With hints of Apocalypse Now (1979) it’s more visually striking than Godzilla (2014), but it’s not as tonally consistent. Skull Island feels one-dimensional in comparison. Vogt-Roberts offers some stage interesting napalm moments, reflecting on sunglasses and exploding silhouette giant beasts. Stay for the after the credits as it teases a showdown with another aforementioned giant monster. Stripped of effects it’s B movie stuff with a A list cast and budget. Most teenagers will no doubt love it, but Kong:Skull Island’s mishmash tone may leave others feeling underwhelmed. A group of terrified passengers fight their way through a viral outbreak while trapped on a bullet train ride to Busan. 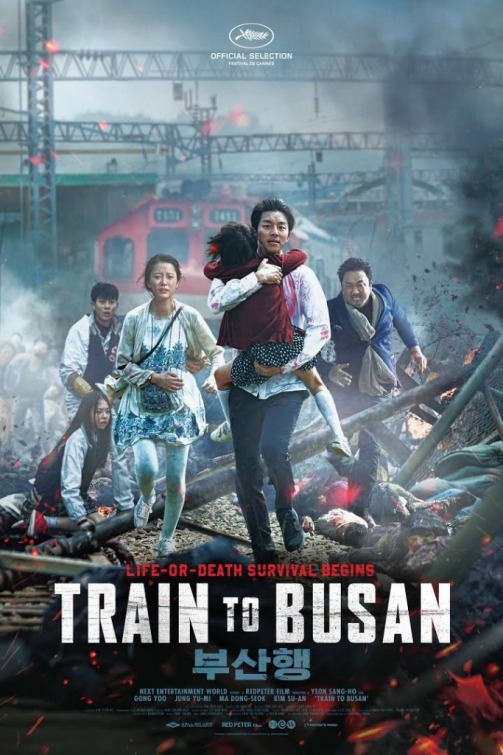 Train to Busan is a blood-drenched South Korean zombie/virus horror, director Yeon Sang-ho and writer Park Joo-suk offer a serious zombie apocalypse yarn. Interestingly most of the bloody, milky eyed and black vein thrilled story is set in the daytime. Joo-suk offers a novel take on the infected, which cannot see in the dark, this makes for some interesting viewing during the more tense scenes especially as the train travels through darkened tunnels. Sang-ho’s twitchy infected are a fast moving reminiscent of 28 Days Later and WWZ at one point there are piles of clambering dead hanging from the locomotive. In addition, this is a decent looking film, not a straight to video, DTV offering, the production values are high and the special effects are impressive. The locations are grounded which adds to the tension and you buy into the characters plight along with the punchy surprise deaths synonymous with the genre. With mistrust between the players there’s a social commentary about the division of class and its pecking order, its only apt it’s set on a train. There are some action packed segments in stations and some subtler moments in tunnels and the city as the survivors encounter the army and contaminated. Surprisingly there’s plenty of emotion especially between workaholic Seok-woo played by Gong Yoo and his young daughter, Soo- an, delightfully played by Kim Su-an who wants to see her mother. Notable is Ma Dong-seok who plays Sang-hwa, a tough, working-class man. Dong-seok delivers some memorable zombie head bashing moments. Sang-ho balances the intense infected action and drama perfectly. Highly recommended virus film.